When someone goes missing in action, they are assumed dead. But, if the MIA Survival knife is in their possession, they will definitely not be found dead! 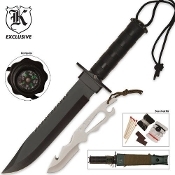 The MIA Assumed Dead Survival Knife is the ultimate in survival knives. It features a heavy jagged sawback design complete with a textured handle for grip and an ABS sheath that also houses a mini survival knife. The included survival kit, found in the handle, includes matches, fishing line, a hook, needles and thread, a safety pin and striking paper. The end of the knife's handle also features a compass just in case you lose your way.